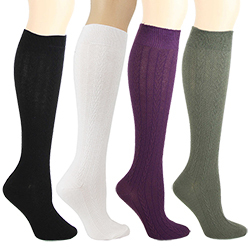 Our new comfortable cotton rag bootsock comes in three great colors-- ebony, granite, and ivory. Perfect wtih boots and hiking shoes. Good quality and fit -just thicker material than I expected so tighter boot fit. My feet are always cold, but not with these socks on. They are great with boots and a skirt/dress, and they feel like a sock and leg warmer in one. Love, love, love them! As well as skiing and snowmobiling....she'll get some serious use out of these! I have worn my ebony boot socks over jeans with my brown boots and also over tights with my black boots. Love the added layer look! Fantastic Socks! I should have bought multiple pairs! They are very thick, warm and comfortaable.